The Saniflo Sanibest Pro grinder pump is used to install a complete bathroom up to 25 feet below the sewer line, or even up to 150 feet away from a soil stack. 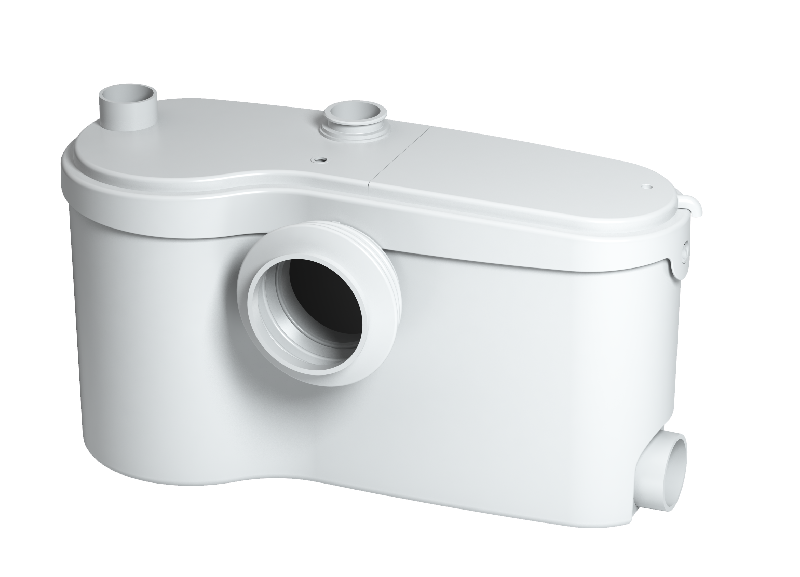 The Sanibest Pro grinder pump can handle the effluent from a toilet, sink, bathtub/shower and washing machine (indirect connection). While most of the Saniflo pumps are macerators, the Sanibest Pro pump incorporates an actual grinder system. The Sanibest Pro grinder pump is ideal for situations where you do not control the use of it (i.e. rental units, offices, etc). The Sanibest Pro grinder pump is designed to deal with the accidental flushing of sanitary articles, such as: sanitary napkins, q-tips, dental floss, etc. Note: In commercial installations, plumbing codes require an elongated bowl to be installed with the Sanibest grinder pump.